Please note that the content of this book primarily consists of articles available from Wikipedia or other free sources online. 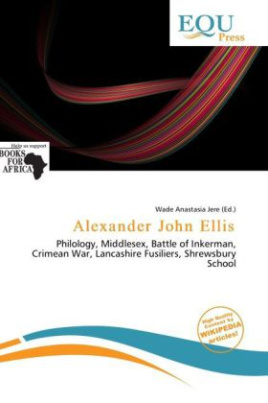 Alexander John Ellis FRS (14 June 1814 - 28 October 1890) was an English mathematician and philologist. He changed his name from his father's name Sharpe to his mother's maiden name Ellis in 1825, based on a condition for receiving significant financial support from a relative on his mother's side. He was born Alexander John Sharpe in Hoxton, Middlesex to a wealthy family. His father, James Birch Sharpe, was a notable artist and physician, who was later appointed Esquire of Windlesham. His mother, Ann Ellis, was from a noble background herself, but was not known by anyone, even to this day, from where her family fortune arose. His brother James Birch Sharpe junior, died at the Battle of Inkerman, during the Crimean War, and his other brother William Henry Sharpe, served with the Lancashire Fusiliers, after moving north with his family, to Cumberland, due to military work. Alexander was educated at Shrewsbury School, Eton College and Trinity College, Cambridge (BA 1837).